Professor Chion is Ph.D. in Engineering-Economic Systems, Stanford University, USA. M.Sc. in Engineering-Economic Systems, Stanford University, USA. Industrial Engineer, Pontificia Universidad Catolica del Peru. Regarding his professional experience, he has been editor of the Confidential Report Macroquantum, monthly note on the situation of the Peruvian economy. He has been a board member of the National Supervisory Commission for Companies and Securities (CONASEV); adviser to two ministers in the Ministry of Economy and Finance of Peru and Senior Advisor in the Vice Ministry of Commerce; advisor to the Peruvian Association of Insurance Companies (APESEG) of the Banking and Insurance (SBS), and various insurance companies; is the creator of the rule solvency margin which currently regulates the insurance of Peru; founding partner, board member and senior consultant Econsult S.A. and Macroquantum; consultant for the Inter-American Development Bank (IDB) and the World Bank. He has also been editor of the Journal of CENTRUM Cathedra. In connection with its intellectual production, Dr. Chion is author of ” Analytical data for structural modeling ” (2016, Editorial Pearson), coauthored with Dr. Vincent Charles. 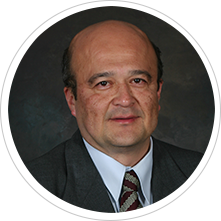 Professor Chion has written scientific articles in national journals as Journal of CENTRUM Cathedra , The Peru Report Magazine Strategia concerning business management and the Pontifical Catholic University of Peru, as well as media. Strategic challenges in the 21st centrury: Innovation, entrepreneurship and coopetition, organized by Strategic Management Society, Roma, June 2016. Presentation: Two-Agent coopetition: dynamics in a Markovian process. Currently a member of the Doctoral Committee, Professor and Researcher at the Academic Area of Finance, Economics and Accounting Graduate Business School CENTRUM Catolica.